A series of murders of beautiful girls occur in Tokyo not long after the end of the war. Also the daughter of a retired actress, Yuzuki Yoko, has gone missing. In the meantime, a religious cult that claims to shut away misfortunes in a box has been gaining popularity, displaying an eerie aspect. Yoko's daughter is alleged to have been run over by a train, and taken into a research institute situated in a gigantic box-shaped building. 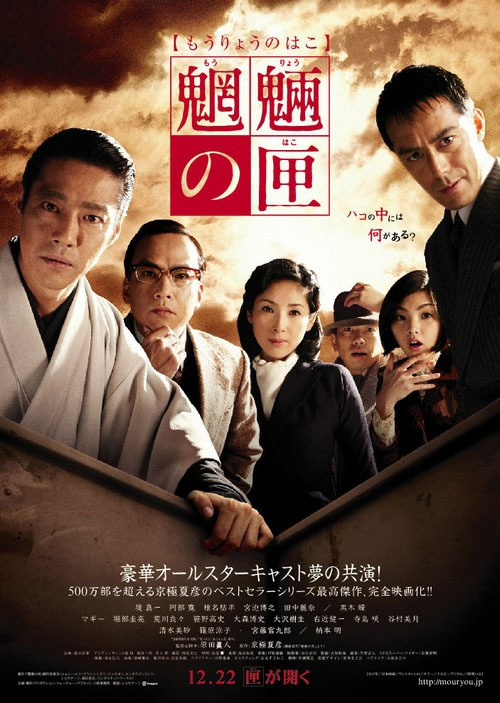 A private detective Enokizu (Abe Hiroshi), a writer Sekiguchi (Shiina Kippei), a journalist Atsuko and a police detective Kiba each pursues their own case, and Chuzenji (Tsutsumi Shinichi), an owner of a secondhand bookshop, "Kyogoku Do" suspects that all cases are linked to the box-shaped research institute. They slip into the building and find out about the human experiment which Dr. Mimasaka has been carrying on since the war. Chuzenji and the others succeed in halting the experiment and the research institute is destroyed. Movie is based on Japanese mystery writer Natsuhiko Kyogoku's 1995 novel "Moryo no Hako" ("Spirit Box").